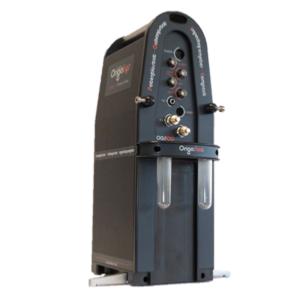 Each potentiostat of the OrigaStat range can be used as a Bipotentiostat. To do so, it is necessary to connect two OrigaStat devices. On one potentiostat, you connect a working electrode. On the other one, you connect the second working electrode, the counter-electrode, the reference electrode (if you work with three electrodes) and a second reference electrode (if you work with 4 electrodes). The electrodes are connected as below, according to the needed configuration. 2 electrodes: Two working electrodes and one counter-electrode. 3 electrodes: Two working electrodes, one counter-electrode and one reference electrode (see the draw below). 4 electrodes: Two working electrodes, one counter-electrode and two reference electrodes. At any case, connect the two GND connectors, with a Banana-Banana cable. Example: two OrigaStat - OGS200. 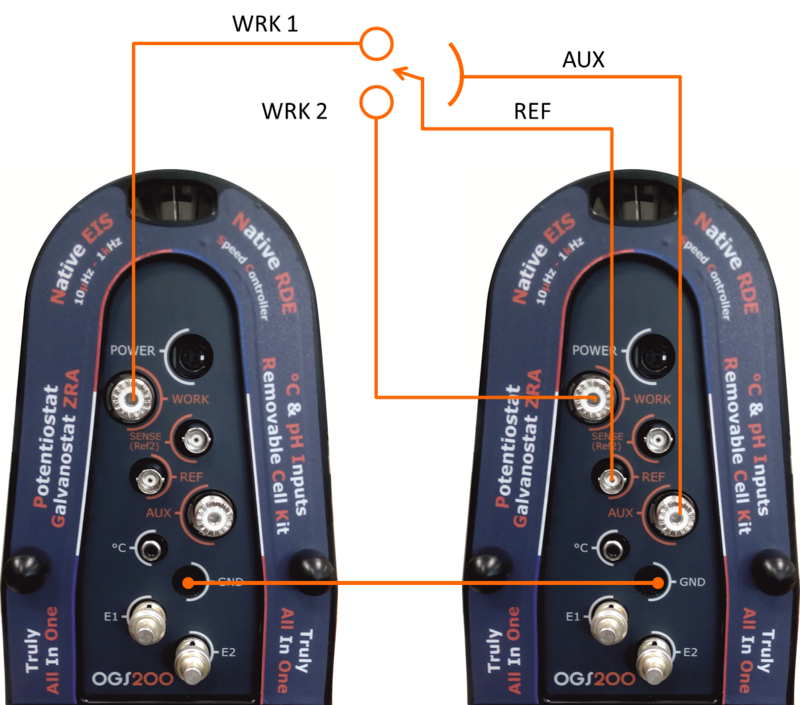 If the "front panel" of the OGS080 and the OGS100 can be different, the electrode connection principle remains the same. Le Potentiostat n°1 is connected to the PC with a USB cable. Into the software OrigaMaster 5, the "START" block has to be set on "NORMAL 2".